We feel proud to introduce ourselves as the leading firm in offering superior quality Heatless Compressed Air Dryer. 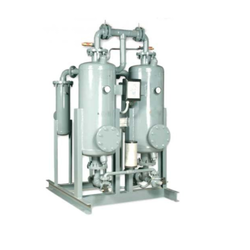 - Find use in majority of Industrial compressed air system and applications. Being an organization with long years of existence, we are proficient in providing products such as Heatless Air Dryer. The offered dryer is mechanized using modern technology and standard components to keep ahead of the competition. The clients admire these dryers for their mechanical design, competent market price and high performance. Absolut offer Heatless Air Dryers as part of compressed air system for generation of dry /instrument air. The moisture content is reduced to a level of (-) 40 Deg C Atm. Dew Point. We manufacture and export an extensive range of heatless type air dryers, which is a simplest form of dessicant type gas or air dryer (drier). These are use to achieving a dew point of -40 c or excellent for compressed air systems and other gas and air dryer (drier) applications. There is no increase in the effluent gas temperature and the desiccant beds remove oil in its vapor form. 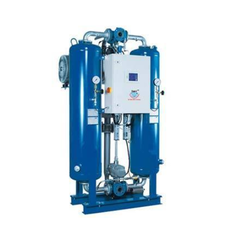 A Heatless Compressed Air Dryer is the simplest form of gas or air dryer for achieving a dew point of -40oC or better for compressed air systems and other gas and air dryer applications.